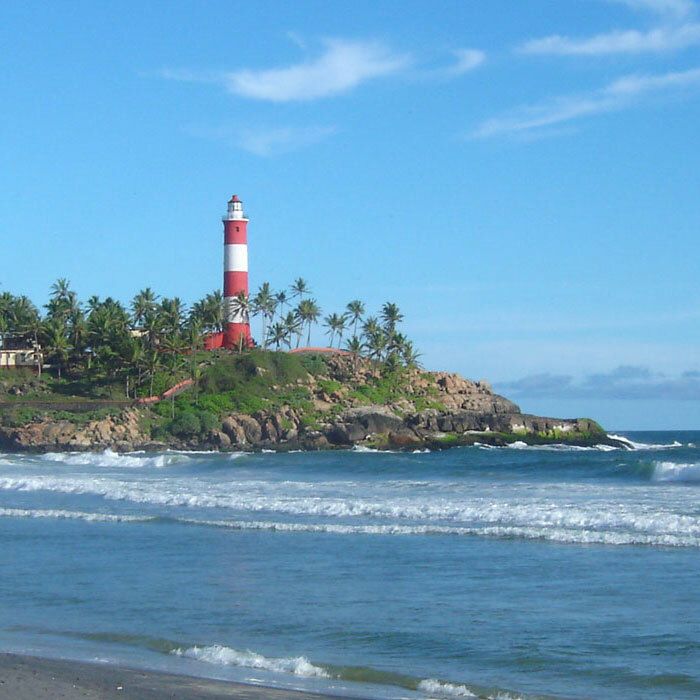 On arrival at Trivandrum airport, we will transfer you to Kovalam (20 Kms / 30 miniuts). On arrival at Kovalam, check into the hotel. Rest of the day is at leisure on the beach. Enjoy the scene of Arabian waves embracing virgin sands in Kerala -Gods own country. Overnight stay at the hotel/resort. After breakfast, full day is at leisure at the beach resort; enjoy the facilities at the resort. The whole day is at leisure at the resort; enjoy the facilities at the resort, overnight stay at the hotel. In the morning, you will be taken on a sight seeing trip of Munnar covering Blossom Park and Tea museum. After lunch, proceed for a sightseeing trip to Mattupetty, Kundala and Eco point. Evening is at leisure. Dinner and overnight stay is at your hotel. Today you will be transferred to the railway station for your journey to Goa. Overnight stay in the train. On arrival at Madgaon(Goa) you will be transferred to the hotel. Rest of the day is free for you to relax at the beach. In the evening enjoy the Goan Carnival theme, which is a part of Goa’s rich Portuguese heritage where revelry, song and dance, great food and good wine come together beautifully. Discover the joy of Goan cuisine at a delightful buffet dinner. Over night stay at hotel. After breakfast, check out from the hotel. You will be transferred to the airport for your flight to Delhi. On arrival, check in at the hotel in Delhi. Morning is at leisure. Later in the afternoon depart for a half day sightseeing of Agra visiting Taj Mahal (Taj Mahal is closed on Fridays), Agra fort, Itmad-Ud-Doulah’s Tomb. Evening is at leisure; overnight at the hotel. In the morning depart to Jaipur enroute visit Fatehpur Sikhri, the city built by Akbar(235 kms,6 hours plus time for sightseeing). Arrive at Jaipur in the afternoon; check in at the hotel, overnight at the hotel. This morning, visit the Amber Fort in the Aravali Hills, which is an excellent example of Rajput (medieval Hindu) style of architecture. In the afternoon go on a tour of City Palace and the Observatory. The City Palace in the heart of the old city is a blend of Rajasthan and Mughal architecture. The Palace of Winds – a five storied structure of pink sandstone has semi-octagonal and delicately honeycombed windows overlooking the main street of the old city. It was originally built to enable the ladies of the Royal household to watch everyday life. Later in the day depart for Delhi (approx 270 kms).On arrival in Delhi you will be transferred to the airport for your onward journey.